This section covers the information that you need to know to populate a simple PivotClient with Relational data completely on the client-side. Register the referred assemblies in Web.config files available inside Views folder and also at the root of the application. Let us now see how to populate the PivotClient control using a sample JSON data as shown below. The JSON data is set to the “data” property present inside the “dataSource” object. “dataSource” object allows us to set both datasource as well as the fields that needs to be displayed in the row, column, value and filter section of the PivotClient control. 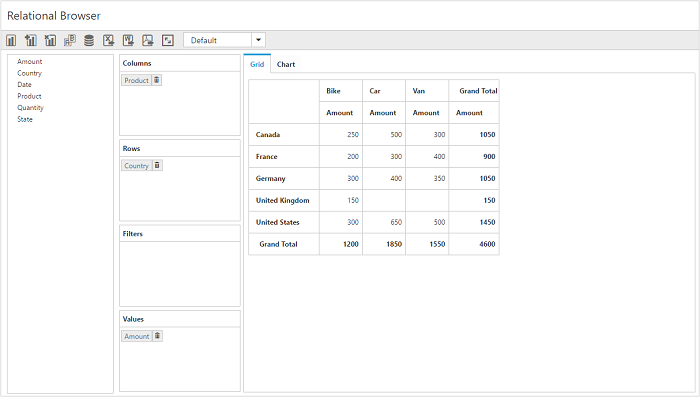 Now, PivotClient is rendered with PivotChart and PivotGrid with “Country” field in Row, “Product” field in Column and “Amount” field in Value section. This section covers the information required to create a simple PivotClient bound to Relational datasource. If you have installed any version of Essential Studio, then the location of Syncfusion libraries is [system drive:\Program Files (x86)\Syncfusion\Essential Studio\17.1.0.38\Assemblies]. Register the required namespaces in Web.config files available inside Views folder and also at the root of the application. The above “Index.cshtml” contains WebAPI URL, which is “/Relational”. If WCF service is used as endpoint, the URL would look like “/RelationalService.svc”. To add a WebAPI controller in an existing MVC Web Application, right-click on the project in Solution Explorer and select Add > New Item. In the Add New Item window, select WebAPI Controller Class and name it “RelationalController.cs”, click Add. Now, WebAPI controller is added to the application successfully with the file “RelationalController.cs”. While adding WebAPI Controller Class, name it with the suffix ‘Controller’ which is mandatory. For example, in this demo the controller is named as “RelationalController”. Next, remove all the existing methods such as “Get”, “Post”, “Put” and “Delete” present inside RelationalController.cs file. The following are the list of namespaces to be added on top of the main class inside RelationalController.cs file. A simple collection is provided as a datasource for the PivotClient in this demo section. This datasource is placed inside a separate class “ProductSales” in RelationalController.cs file. Refer to the following code example. Define the service methods inside RelationalController class, found inside RelationalController.cs file, created while adding WebAPI Controller Class to the Application. string conStringforDB = "";//Enter appropriate connection string to connect database for saving and loading operation of reports. 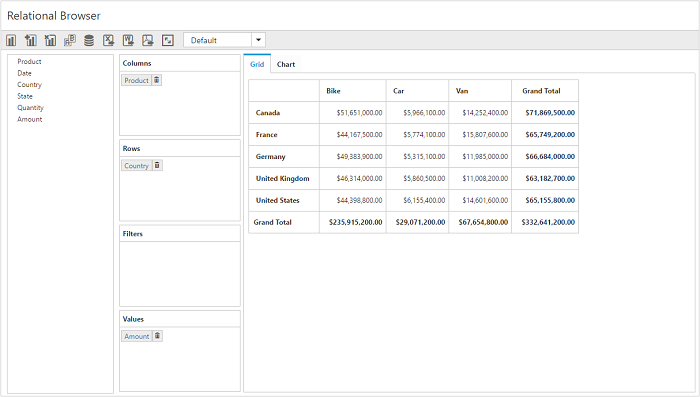 Now, PivotClient is rendered with PivotChart and PivotGird with “Country” field in Row, “Product” field in Column and “Amount” field in Value section. This section demonstrates the utilization of WCF service as endpoint binding Relational datasource to a simple PivotClient. For more details on this topic, click here.